For attracting eyes to your PDF document, you can use annotation symbol to annotate some contents. By using the editing program PDF Editor, you can easily add annotations, hyperlinks, stamps, lines to the inputted PDF document. With PDF Editor, you can more conveniently work with PDF documents just by some clicks with your mouse and some hits with your keyboard. 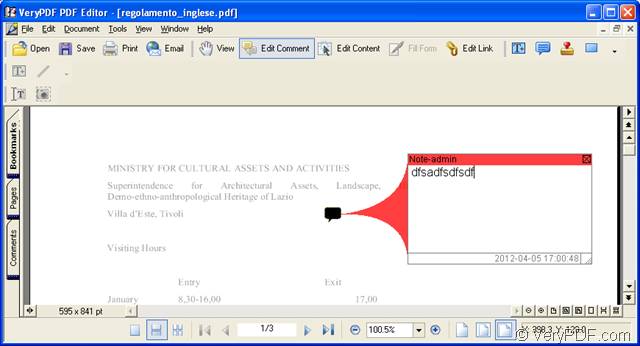 For smoothly using PDF Editor, you can download the free evaluation version of it at http://www.verypdf.com/pdf-editor/pdfeditor_setup.exe. Please follow the installation wizard appearing on your screen after you double click the setup file for installing the application on your computer. You’d better create a desktop icon so that you can find and use PDF Editor anytime. 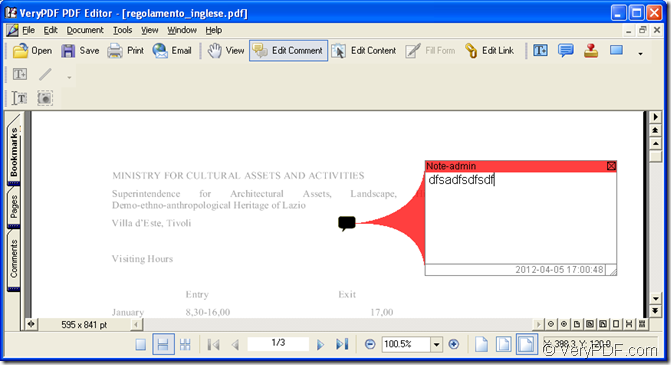 For adding annotation symbol to your PDF document, the first thing you need to do is to open the application. Please double click the desktop icon or right click the icon and choose “Open” option in dropdown list. If you cannot find the application icon, please use the following way to run PDF Editor: Click “Start”—“All Programs”—“VeryPDF PDF Editor v2.6”—“VeryPDF PDF Editor”. 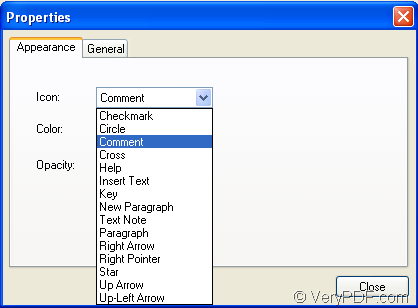 The user-friendly interface of PDF Editor will come out and you need to open the source PDF document in it. You can take any one of the following ways: (1) Please click “File”—“Open” to open “Open” dialog box in which you can choose the file you want to edit, then click “OK” button. (2) Click “Open” button in the toolbar to open this dialog box. (3) Use the keyboard shortcuts “Ctrl”+ “O” to open the same dialog box. The next step it to add PDF annotation symbol for it. 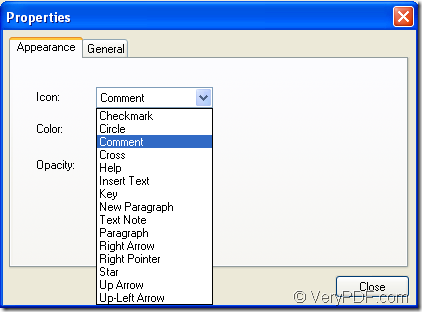 Please click “Edit Comment” button in basic toolbar or click “Tools”—“Edit Comment” to open comment status. Then the buttons in comment toolbar will be usable. Then click “Add Note” button in comment toolbar or click “Tools”—“Comment”—“Note” and you will see a note icon appear on the default position of PDF document. Please see Figure 1.You can drag it to anywhere you like with your mouse. It is the default symbol of the note icon. If you want to change the annotation symbol, please right click it and click “Properties” option in the popup floating item. You will see the dialog box named as “Properties”. In the appearance control panel, please click “Appearance” pane and you will see there is an “Icon” dropdown list in which you can choose different kinds of annotation symbols. Please see it in Figure 2. By double clicking the annotation symbol, you can also edit comments in the popup comment window. When finishing, you can close it and you can double click the symbol again when you want to see the comments. Please save the changes you have made via clicking “Save” button in toolbar or click “File”—“Save”. Then you need to generate a new PDF document by clicking “File”—“Save as” to open “Save as” dialog box in which you are able to choose the location, name for the new PDF document. Then save it. These are all the operations for adding PDF annotation, if you want to get more functions or more descriptions about PDF Editor, please visit its homepage at http://www.verypdf.com/app/pdf-editor/index.html or read its user manual at http://www.verypdf.com/pdf-editor/pdf-editor/index.htm. This entry was posted in PDF Editor and tagged annotation symbol. Bookmark the permalink.